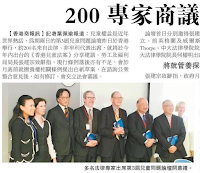 On November 13 and 14 the HKU Faculty of Law co-hosted the Third Children’s Issues Forum in collaboration with the Chinese University Faculty of Law, the Hong Kong Family Law Association, and the Law Society of Hong Kong (with support from the Hong Kong Bar Association). 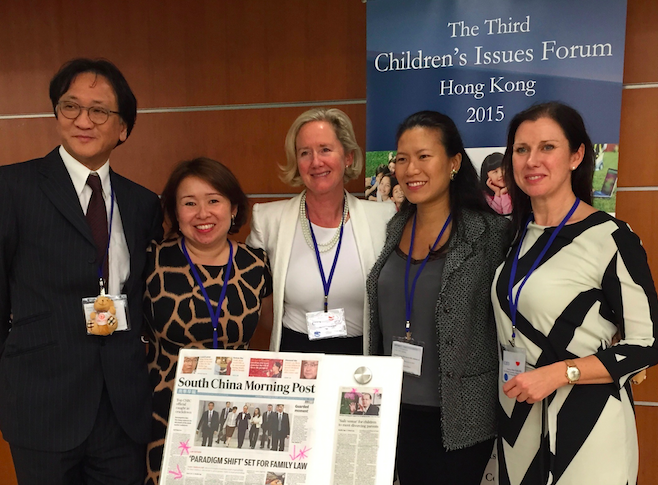 The purpose of this Forum (and the previous two) was to highlight the legal and related issues affecting children in Hong Kong and globally and to advocate for multidisciplinary reform of the law and policy on children and family justice generally. 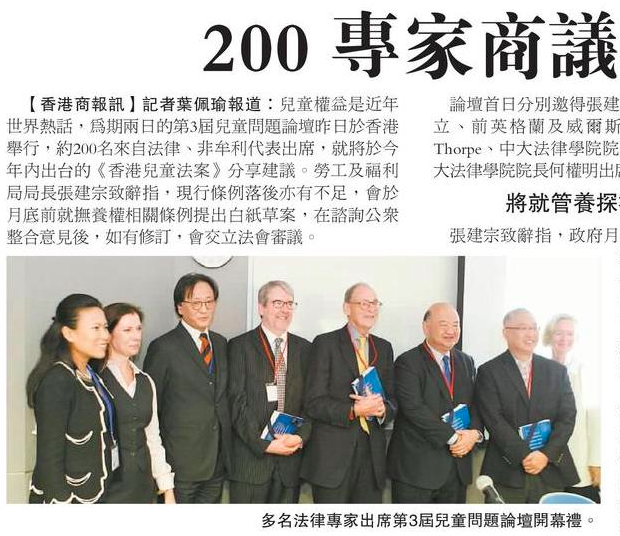 After a welcome from the Deans of the CUHK and HKU Law Faculties, Prof. Chris Gane and Prof. Michael Hor, The Hon. Chief Justice Mr. Geoffrey Ma Tao-li opened the Forum noting the importance of protecting the best interests of children, and the role of law in doing so, especially as they are often amongst the most vulnerable in our society. 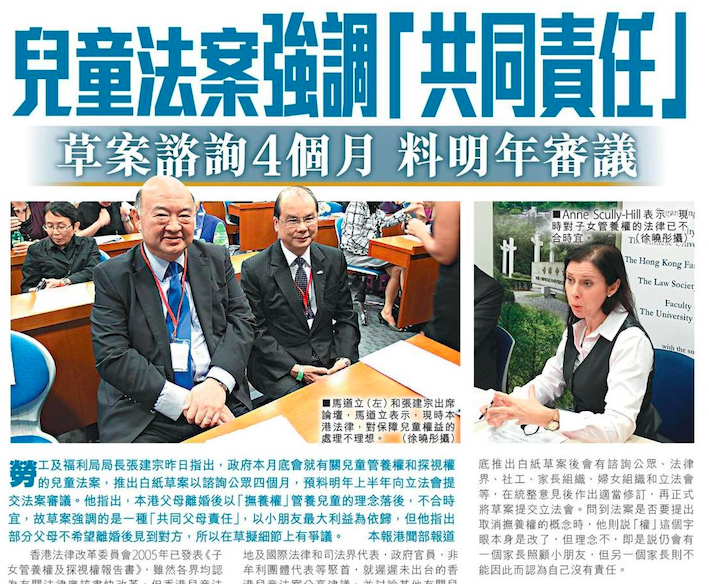 During the course of the Third Forum held at CUHK, a packed conference hall heard over 40 speakers address child related topics as diverse as child custody, the Family Court’s innovative Children Dispute Resolution procedure, perspectives on representing children in legal proceedings, frontline workers’ experiences of addressing children’s issues and the need for accurate and sustained data collection to inform the creation and implementation of effective policies on children’s issues. Speakers from Hong Kong included members of the Judiciary, barristers and solicitors, medical professionals, academics and also social workers, therapists and representatives from NGOs. Importantly for a conference on children’s issues, young people form Kids’ Dream, one of the first children-led NGOs in Hong Kong, also took part in various panels during the Forum. Speakers from overseas included senior judiciary from England, Australia, Singapore, Macau and Canada; lawyers from the UK and the PRC; academics from Japan, Singapore, Norway and Israel; and the Asia regional representative of UNICEF. For more information on the programme and speakers, please go to www.cifhk.org. During the first panel of the Forum, the Secretary for Labour & Welfare, Mr. Matthew Cheung GBS JP announced - for the first time in public - the imminent publication of the long awaited Children’s Bill and the government’s commitment to set aside resources to ensure the successful implementation of the practical infrastructure necessary to support the legislative changes, for example, supervised contact centres. Mr. Cheung confirmed that the Children’s Bill will be released by the end of November. 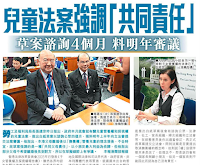 This reform is something which has been discussed and advocated at the previous two Children’s Issues Forums in 2009 and 2012 and so we were delighted that the Secretary chose to make this announcement at the Third Children’s Issues Forum in the presence of the HK media. We look forward now to receiving the Children’s Bill and to continuing the progress towards legislative and practical reforms, particularly the creation of a Children’s Commission, to ensure that Hong Kong children have the best child law possible. Written by Katherine Lynch.